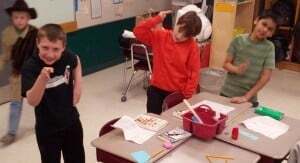 The Wax Museum project has become quite the tradition and expectation in our fourth grade. For over twelve years, the fourth graders at Cashman Elementary School have been researching about a famous person who has made an impact on society, creating a poster to represent their life, dressing like the person and giving a speech to give to passers-by who pause to press their buttons. This is my fifth year teaching this grade level, but even only after that many years, I needed to give the project a jolt – for myself really. Yesterday I was able to do that with drama. One of the other teachers, Beth Cavalier and I combined our classes to have a Studio Day and introduced the students to some carefully chosen theatre concepts and drama games. The outcome was fantastic! They had fun, they tried new things and they learned a bit more about their person and themselves. A serious Annie Oakly poses with her rifle. Each Wax Museum character needs to choose a pose to be in as they stand in the halls of the museum-school waiting for someone to press their button and help them come alive. For the past few days, I’ve had my students practice standing in their pose while every so often I ask the class to recite their speech. As a warm up to our Studio Day, the other adults and I walked around the room where the 50 students stood frozen and stopped a student one by one and had a conversation with them in character. “Who are you?” I would ask. “I’m Amelia Earhart,” she would reply. I was impressed at how the students were able to stay in character and answer our questions, pulling the information they had learned and utilizing it on the spot. They didn’t recite their speeches, they actually had a conversation. Of course some students had a hard time with this a first, but with a little perseverance, they were able to do the same. The other part that was really enjoyable to watch was how the students started to gain a better understanding of their pose. For example, when I was speaking to Mary Curie, I found out she was holding a beaker. At first she did not know what was in the beaker, but with a few prodding questions, she was able to figure it out – it was radium. It’s those little details, the students (and I) were finding out, that really help an actor get into character and make them more believable. The next two activities the students did came from a wonderful resource created by Marly Parker and Angela Heidgerd. They have a great website called Capture the Drama where they not only explain drama exercises and games they use in classrooms, but they have videos that help illustrate what the kids do. I referred to it often when creating this Studio Day. During Hello-Goodbye, the students practiced making eye contact with one another as they introduced themselves as their characters. It was great practice having the students get in character and stay there. We also talked about how to use body language that would match your person as well as facial expressions and mannerisms. 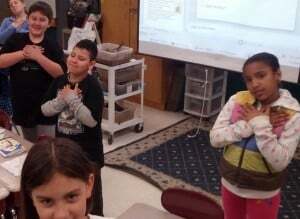 The other activity, Gestures, allowed students to put a line their person would say to a gesture we gave them. The first was a questioning one. Click the link for a video of Richard Nixon making an exclamation to the world. The second was a more commanding one. Click the link for a video of Babe Didrickson telling you what is on her mind. These Wax Museum figures want you to understand something here! and the last gesture got students to say something completely different. This exercise in particular was great at getting the kids to really think like their Wax Museum figure. Some students caught on quickly, thinking of something right on the spot, while others had to take a little while to think of something. But that was the point, they had to think, stop and think about the situation their person would be in to make a gesture like that, how they would feel and what they would say. We chose four characters and then set the scene: You have been working all morning, and now you finally have a break for lunch, so you come to the pic-nic table to sit and eat. Character one comes to the table. After a moment, character two comes on stage. The two characters interact with one another. Character one wraps it up and goes off stage. Character three comes to the table. The two characters interact with one another. Character two wraps it up and goes off stage. Character four comes to the table. The two characters interact with one another. Character three wraps it up and goes off stage. Character four wraps it up and goes off stage. The first time you do this, the characters do not speak, just use motions and gestures. Then the same group runs through it again adding in dialougue. It’s an amazing (and amazingly fun) exercise! Our first run of this involved Norman Rockwell, Thor, Florence Nightengale and Babe Didrickson. 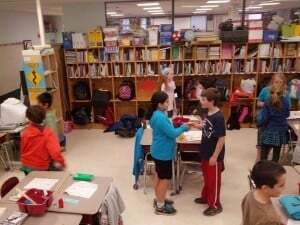 Our second found Daniel Boone, FDR, William Shakespear and Annie Oakly interacting with one another. It was great to see the students literally bring their characters’ behaviors (and problems and excitements and tales of woe) to the table. Roosevelt hobbled to the table and once there, unloaded a huge stack of paperwork he needed to get done. Florence was very distraught as she had just seen yet another solider die in front of her despite her effort to keep him alive. What was it like being your character for the activities today? What was your favorite part about being your person? Were you able to get a better understanding of the pose you will be keeping in the Wax Museum? I am not an actor myself. The only things I know about acting is from being “spotlight operator” in high school one year and then acting myself in a variety of theatre games through professional development. Acting is not my forte, but bringing it into the classroom proved to be very beneficial to our students. 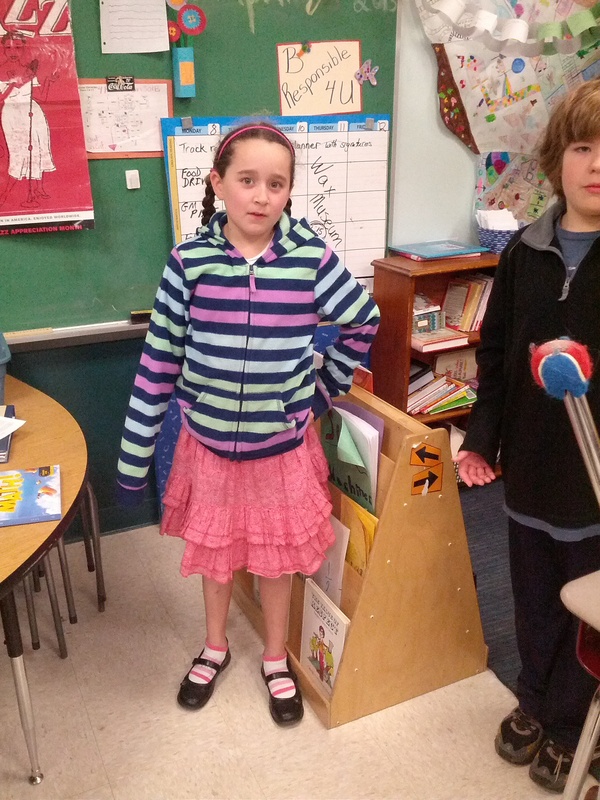 Whether they realize it or not, they learned a lot yesterday about themselves and their Wax Museum figures. And I am so glad we took the time to help them dig a little deeper into their project through drama!